I’m on annual leave this week. I didn’t go anywhere or do anything special. I just had time off. It’s been really nice. As a bonus I only had to use 3 days out of my annual leave allowance due to the Queens Diamond Jubilee. Ta muchly Queen Liz! I suppose I could have done a ton of work in my flat… but nah, I just vegged, oh and I started a BLOG of course! That one is thanx to Mrs M, my colleague who came up with the bright idea that I should be loosed upon the world wide web! Last week I woke up all dizzy and fell back into bed. Not intentionally. I lost my balance. Then a short while later I threw my head upside down so I could blowdry my hair and I just kept going…. I fell over! If any of my friends had seen it they would have peed themselves laughing… cos that’s the kind of friends I have. That was the closest I’ve got to a forward roll in at least 15 years! I know I look like I should roll easily but I don’t. I saw my gp that morning and she told me I had labrynthitis (of which vertigo is a symptom). An inner ear inflammation. It wasn’t painful at all but I was a bit unbalanced. I ended up taking two days off work sick, so although I’ve taken 3 days annual leave, by the time I go back to work I’ll have actually had, including 2 weekends, 11 days off altogether. Nice! And yet, with only 2 of those days left, it doesn’t feel like it at all. When I go back on Monday it’ll be as if I never left. I’ll slot back in at my desk and normality will resume. On a brighter note, my colleagues are a big part of my daily life so they are guaranteed to give me blogfodder all the time I work with them, WAHEY! … especially doing the job we do, which I will tell you about another time. Getting back to me and my dodgy lug-holes…. The most annoying thing about labrynthitis is that it makes the tinnitus so much worse. I’ve had it for years. I can’t remember the last time I heard…. well, nothing! I would love to lie on my bed and remember why they say silence is golden. My life is constantly noisy. Someone give me some new ears please. These ones are faulty! They ring at me 24/7. A lot of the time I don’t notice it, but that’s when there is outer noise to replace the inner noise. But even that isn’t working at the moment. I think the labrynthitis is on the mend because I don’t feel dizzy anymore but the ringing is louder than ever so I’m wondering if this is going to be a permanent change. I’ve already got a noise generator on my phone which plays different coloured noise. You’ve probably heard of white noise. Well, I prefer brown noise which is similar but a lower frequency. If I stick it on oscillate it sounds like the sea. I love the sea. Talking of the sea. I went to the cinema today with the parentals. We went to Cineworld which is at the marina and when you leave, you have to follow the one way system. That involved driving past the marina wall. On the other side of the wall is the English Channel. 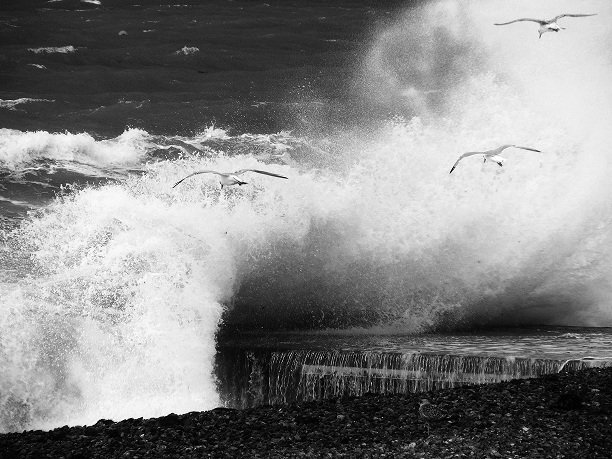 Right now in Sussex we are experiencing some seriously strong winds with 70mph gusts. The kind of winds that turn the sea into a seething, roiling, rolling, thunderous mess, the kind of winds that blow the sea half a mile into the air before it comes crashing down again. 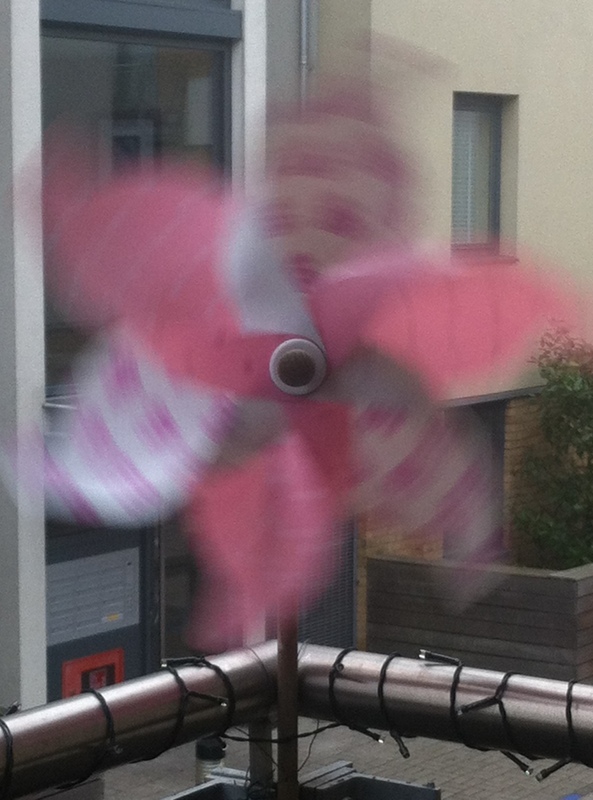 My balcony windmill has never been so busy! So as we’re driving along, all of a sudden the car is submerged, sort of! Dad had to hit the brakes because for a few seconds there was nothing but water. The car was enveloped. I wouldn’t have been surprised to find Nemo swimming past the window! It was like God had filled up his giant Godsize bucket in the English Channel and tipped it out right on top of us. It was Brilliant!!! Thank goodness we didn’t have a sunroof. People PAY to have experiences like that in amusements parks! It didn’t last long enough though and it does mean that dads’ car is now coated in seasalt and needs a good wash, but it was totally worth it. Posted in: Stuff out of my head.